In January last year, shortly after Prime Minister Shinzo Abe returned to power, the government created the Industrial Competitiveness Council to study concrete steps to strengthen Japanese industry’s international competitiveness, which has weakened in recent years. Indeed, many Japanese manufacturers were forced to retreat from the market of fast-selling smartphones and tablets after being caught between two fires from Apple Inc. of the United States and Samsung Electronics of South Korea, and being caught up fast by their Chinese competitors. Japan was also outdone by China and South Korea with regard to environment-related products such as storage batteries and solar panels, which had been Japan’s forte and appear to have promising growth in the future. The council, made up of representatives from various industrial segments, singled out the low educational standards of Japanese universities as the main cause of the deterioration of the nation’s industrial competitiveness. The 2013-2014 version of the Times Higher Education survey conducted by the Times of London showed that only two Japanese universities were among the world’s top 100 institutions of higher education, and another three were ranked among the next 100. Even more surprising is the ranking of universities in the Asian countries by the same Times survey, which showed that only two schools from Japan — the University of Tokyo and Kyoto University — were among the top 10 schools in the region, compared with three from South Korea, two each from China and Hong Kong, and one from Singapore. Asserting that the power of university education is the nation’s power itself, Abe has come up with an ambitious target of qualifying 10 Japanese universities among the world’s top 100 by 2020. This goal, however, is utterly unattainable. Many universities in Europe are either run by the government or hold the status of national university corporation, with the state pouring large sums of money into them. In Finland, which boasts of the highest educational standards in the world, every stage of education from kindergarten to postgraduate school is free. The state bears virtually all the costs of education, with students paying nothing for admission, tuition, school meals and textbooks. In the 28 member nations of the Organization for Economic Cooperation and Development (OECD), the average amount of government spending for institutions of higher education is equivalent to 1.0 percent of gross domestic product (GDP). Denmark and Finland top the list with 1.6 percent each while Japan places second from the bottom (27th) with 0.5 percent, followed only by Chile with 0.3 percent. The comparable figure for the U.S. is 1.0 percent, the same as the OECD average. In the U.S., however, the costs of public university education are borne not by the federal government but by individual states. Tuition fees at private American universities are extremely high. The “Best Colleges 2010″ report published by the U.S. News & World Report shows that the average tuition fee for 53 private universities covered by it amounts to about $36,000. State-run universities have dual tuition standards. The average tuition fee for 47 state universities is about $9,000 for students whose parents reside in the respective states and about $25,000 for other students, according to the same report. Thus in America, a student going to a university run by a state where his or her parents reside pays nearly twice more tuition than a student of a Japanese national university, and quite more than European students. But American universities, be they state-run or private, all have dormitories where students can live comfortably and inexpensively. Thus their costs for accommodation and meals are very cheap. Moreover many schools offer generous scholarships and students with good academic records are sometimes exempted from paying tuition. Since money donated to universities in the U.S. are tax deductible, not a few high-income people and foundations make donations to universities. Such being the case, European and American universities are much better off economically compared with Japanese institutions and thus can spend large amounts of money on improving the quality of education and research, to place high in the global rankings. In countries other than Japan, including the newly emerging economies of Asia, huge amounts of funds are funneled to universities from the government, business corporations, foundations and wealthy families. In Japan, on the other hand, not only are government expenditures on higher education limited, but universities receive much smaller donations from private sources than their European and American counterparts, as the money donated by businesses and wealthy individuals in Japan may be written off on taxable income only, not on the tax itself. These economic constraints hinder the efforts by Japanese universities to improve their educational and research environment. As a result, they battle against heavy odds in the global rankings. The relative poverty of Japanese universities pushes the remuneration of their teachers to much lower levels than that of their counterparts in other countries. Nor is it easy to break the seniority system prevalent among Japanese universities. It is quite rare for anyone in their early 30s to reach a full professorship. Academic achievements are hardly reflected in the teachers’ pay. The average annual salary for American university professors is about $200,000 for the nine-month academic year (excluding summer vacation). If they use the summer months for research covered by grants from sources like federal science foundations, their total annual income comes to about $260,000 a year. Even a young assistant professor who received a Ph.D. degree just a few years earlier earns as much as $100,000 a year on the average. The disparity between Japanese and American universities resembles that between American and Japanese baseball leagues. In Japan, many professional baseball teams rely heavily on foreign talent. A team gets a big boost when it signs an American Major League player who may be about to retire, for hundreds of millions of yen per year. Thus the way has been opened for players considered to be over the hill in American professional baseball to earn exceptionally high salaries in Japan. 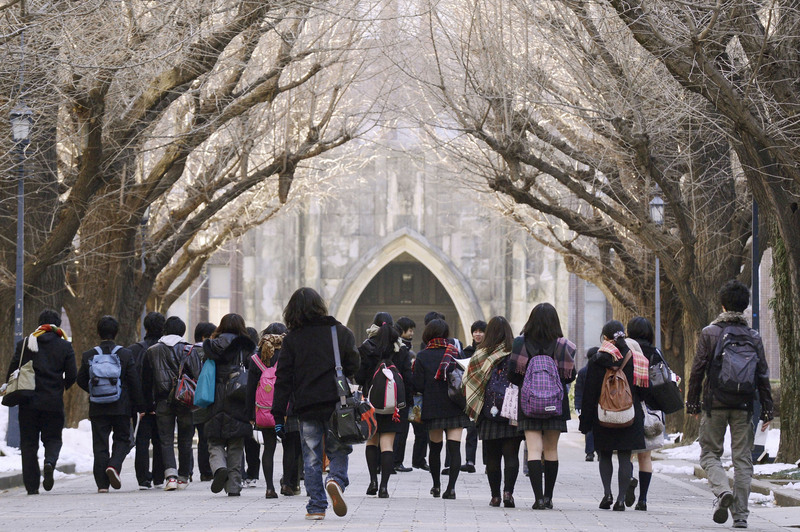 Bureaucrats at the Ministry of Education, Culture, Sports, Science and Technology seem to think that the standards of education and research at Japanese universities can be elevated if each school pursues reform programs on its own. But to increase Japan’s university power, I cannot think of any shortcut other than to strengthen universities’ teaching staff by hiring teachers from foreign countries — just as Japanese professional baseball teams hire American professional baseball players. In reality, however, a Japanese university would have to be ready to pay at least $300,000 a year if it were to hire an American researcher with a well-established track record. Unless the government will guarantee shouldering the personnel costs, it will be impossible to fill 10 percent of the teaching posts at Japanese universities with scholars from other countries. Another problem is the fear — felt by a significant number of people — that the “spirit of harmony” that constitutes the fundamental culture of Japanese universities could be seriously harmed if professors from abroad get paid three times more than their Japanese colleagues. Thus, in view of the big disparity in the pay scales between Japanese and American universities, the notion of elevating Japanese universities’ standards by inviting outstanding foreign professors is a castle in the sky. It is asking for something that is impossible to attain.